To join, or if you have questions about membership and all the benefits, please contact Membership Secretary, Charis Martinez at 916-564-RDRS (7377). Are you having a game day bus this sunday the 18th. At the request of our members and hard working volunteers who coordinated the buses and tailgate parties we now do informal carpool/caravans to the games. It has worked out very well and proved to be more enjoyable for all. Plus, the benefit to you: It’s FREE! As a native son of Sacramento, CA this is a great site! I have been a fan for some time though too be honest I have followed college football much more closely over the past 20+ yrs. (Pac 10 & SEC) My borther-in-law is a huge fan & we will be attending a couple of games this season. I look forward to seeing them in action & wish them much continued success. Do you guys have a bus to the Charger game? or are you doing a train ride. Btw, you guys really need a “contact us” link, so that prospective members can contact you with questions…either that or a blog that gives a list of upcoming events. 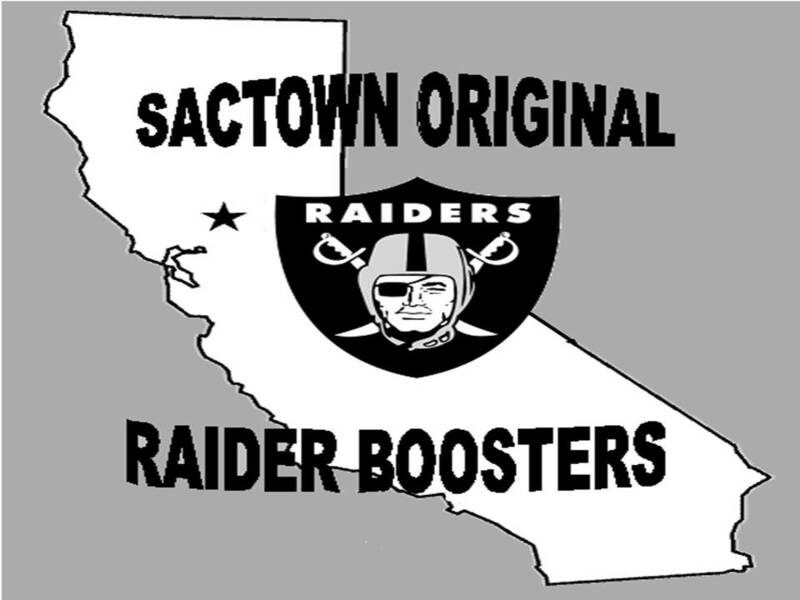 Thanks for contacting the Sactown Original Raider Booster Club. All of our members drive to the games now. We are not doing buses to the game. Sometimes we carpool. This year we did an Amtrak trip for the Raiders v. Broncos game (pictures coming to the website eventually… We do tailgate hopping at the Coliseum to the spreads various members put out. If you are interested, please email me and we can put you in touch with where they are. One of of members also put together a “mini away trip” to the San Diego game (pictures coming eventually…lol). Our club is fun and relaxed. We do enough events for everyone to have a good time and allow the coordinators to enjoy themselves too. We also get together in the off season. Great idea about the contact link. I will put you in touch with Lane Hayashi, our Membership Secretary and also the suggestion about contact links for prospective members on the web. Lane is a GREAT resouorce! He coordinated the “mini away trip” to San Diego and also has members’ tailgate parties mapped out. Generally, our upcoming events (coming slowing to the web) are posted on the front page of the website and/or under the categories in the sidebar. Other booster club event, which many of us attend, (also coming to the web) are also posted in the sidebar. The good thing is that we’ve had fantastic attendance at our events this season, met some awesome new Raiders fans, had some great times and a great season so far. We hope you’ll join us too! 2011 started with the Commitment to Excellence Dinner in March, the Draft Day party in April, the big season kick off trip to Raiders training camp (which had to be done by lottery because the demand to get in was so high), all of our Raiders away game parties at MVP – including the one attended by former Raiders linebacker Jerry Robinson, and the Amtrak trip and HOSTED tailgate party and open bar to the Broncos @ Raiders game, the mini “away on the training camp field was so high, the end of the season holiday. It’s been a great Sactown season and we hope you’ll join us. Even if you’re out of the area, we have a $15 Associate Membership the keeps you update on upcoming events and potential entree into Raiders training camp.